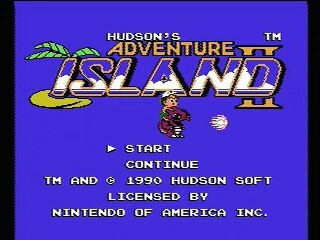 Adventure Island II was released in the US in February 1991 by Hudson Soft. The game's formula follows that of the first game. Island hop your way through 8 worlds full of classic 2d-platforming action and save the kidnapped girl from the evil witchdoctor. The second game turned down the difficulty a notch, but compensated by increasing the fun factor instead. New elements such as dinosaur helpers and an overworld map were introduced and the levels got more variation to them. Best time: 0:24:26 by 'Whitman_Price_' on 2014-06-21.